​After parking the bikes in the restaurant that night, we woke up to a cloudy day, and then the rain started, so we made the decision to stay another day. Walking around the village, there were some interesting sights to say the least, including guys in dresses that were so off their faces they had a hard time standing up! The bikes in the restaurant in Varma Veche, after we moved some of the tables around. The rain was gone the next day, so the three of us headed out up the coast to Costansa, passing through Mangalia, where Daewoo have a huge ship building yard, very impressive to see. 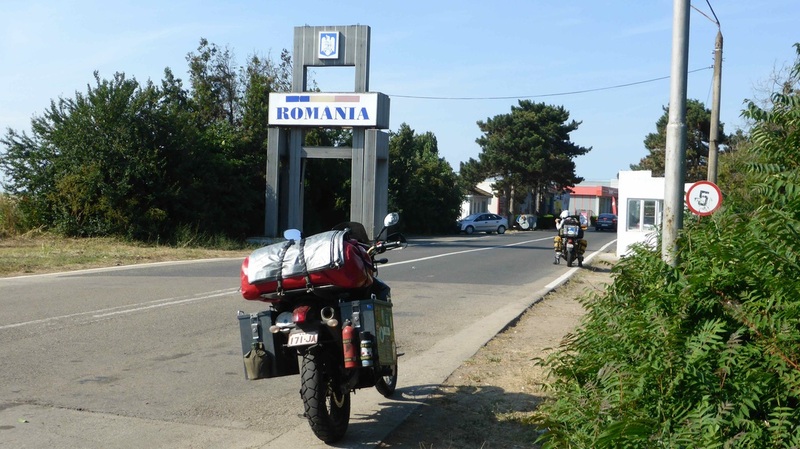 At Costanza, we turned west towards Bucarest, good road, but boring riding for a while. We decided to turn off onto secondary roads to Brasov via Buzau, and the road was definately not boring, pretty rough in fact. While stopped for a drink beside the road, a shepherd bought his flock of sheep past, just him and his dog, and it was interesting how they spread out over the wide flat grassland, nothing happening in a hurry. Passing through a village on a range, a young dog ran out onto the road and chased Lyn's bike, not seeing me coming along behind her. As it slowed down, it turned in front of me, and I just clipped it with a foot peg, enough to bowl it over and make it squeal, but not enough to hurt it. I hope it learned a lesson from that, and no longer chases bikes! We dodged a couple of storms along the way, just getting the edge of the rain, but not getting too wet. Arriving in Brasov, we scored a room for the night in a hotel. We were now in Transylvania, so we had to visit the castle in Bran, home of all the vampire legends. As we had heard, it was very touristy, hundreds of people there, and coaches bringing more all the time. 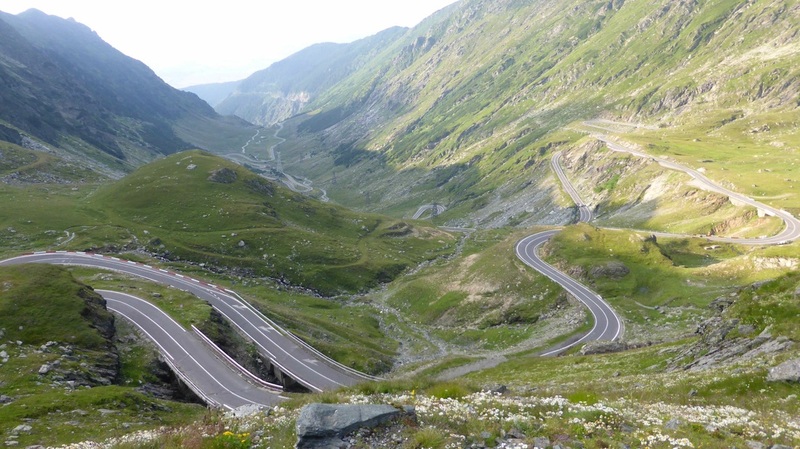 We did the obligatory tour and moved on, heading for the Transfagarasan pass. Climbing up over another range, we stopped for lunch at a hotel, and got talking to the guy at the next table. He was also a biker, so we talked to him for awhile. He presented us with a local desert, a sort of sweet bread coiled up like a spring, and covered with honey, very nice. Terry and I in the castle courtyard in Bran. The road up over the Transfag coming from the south is bloody awful, lots of gravel and potholes, but not much traffic. 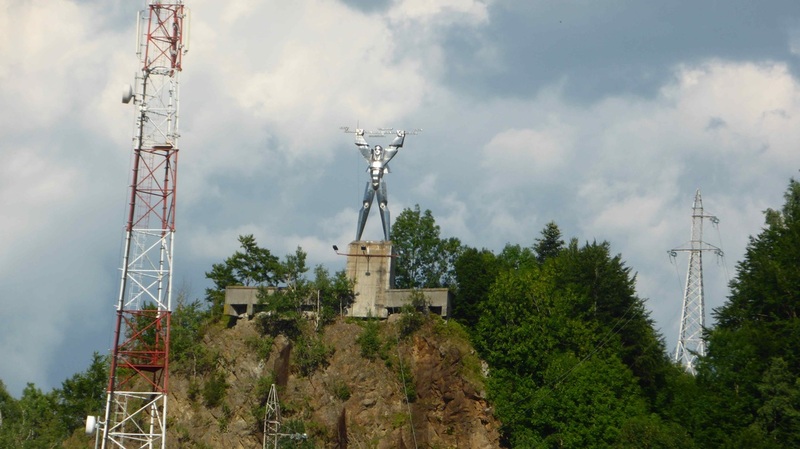 There is a dam you ride past, with a giant chrome statue of a robot looking dude holding a lightning bolt up over his head, it must be a symbol of the hydro-electric power generated there. The good road that is photographed and people rave about is on the northern end, and doesn't go that far. I must admit I was little disappointed with it after the build up it had been given. 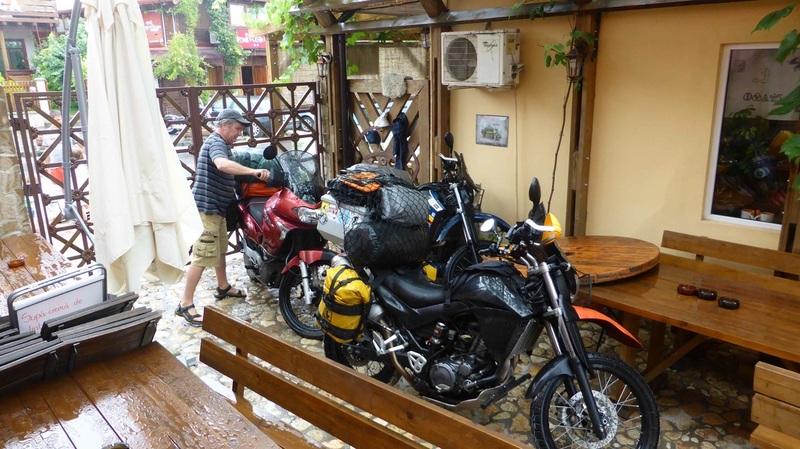 We were lucky with the weather, lots of rain threatening, but we seemed to dodge it, and made it to a guest house down the bottom where we stayed for the night. Part of the good side of the Transfag. 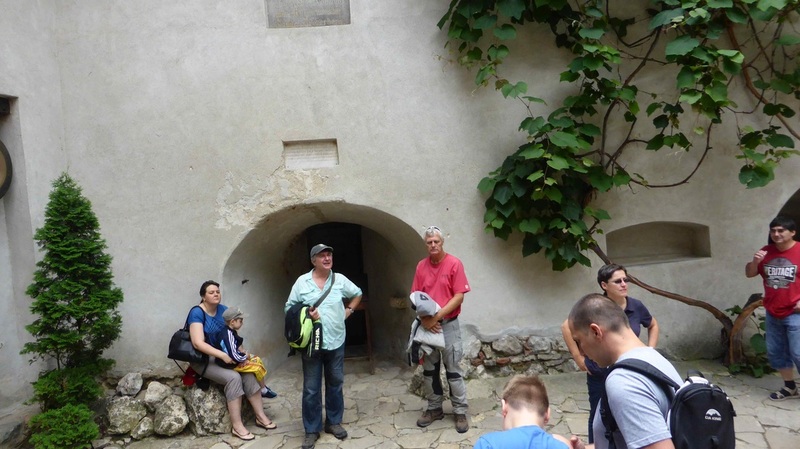 The next morning we continued on to Sighisoara, along a rough, bumpy, windy road, where we had a look at the citadel, then on to a much better road through Medias to a hostel in Sibiu, to meet up with Poly, Peachy, and Shane, who we had last seen in Bulgaria. Great to catch up with them, except they made us drink too much again!! while Lyn and I left at our usual late hour to meet them down the road a bit. It seems the signs they use to promote the event are good souvenirs, so we struggled to find them. 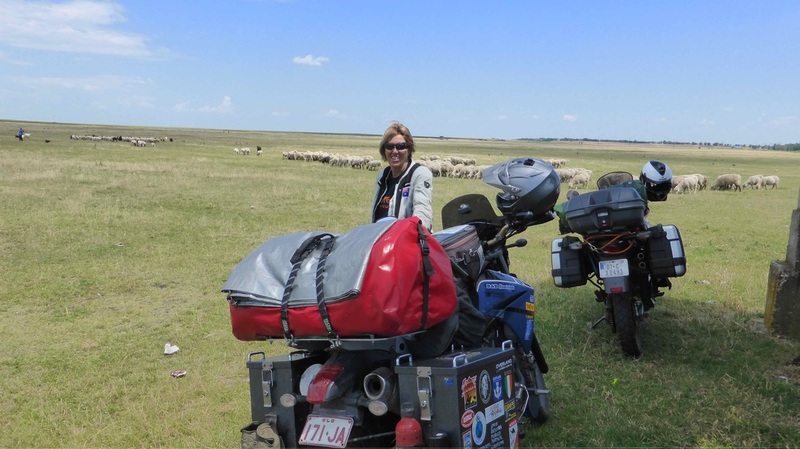 We eventually found Terry, and took off for the Transalpina, another great pass that runs parallel to the Transfag, that we wanted to ride. The GPS was hopeless here, and the new road made things worse, so we got lost trying to find it. We eventually worked it out, and were treated to some fantastic views, although in some places the road was gravel, and it had started raining. As it was cold as well, we booked into the Hotel Otto near Ranca, at the bottom of the pass, to dry out. When we booked in, the staff told us there was going to be a party there that night, and it might be noisy, but it wasn't too bad. It turned out to be a christening, and I ended up dancing with the babies Grandmother in a group of people who spoke no english, and wondered where we had come from! Lyn getting some fresh water from the well at the village where the Romaniacs were riding. Looking down to the village of Ranca, from the top of the chair lift area on the Transalpina. 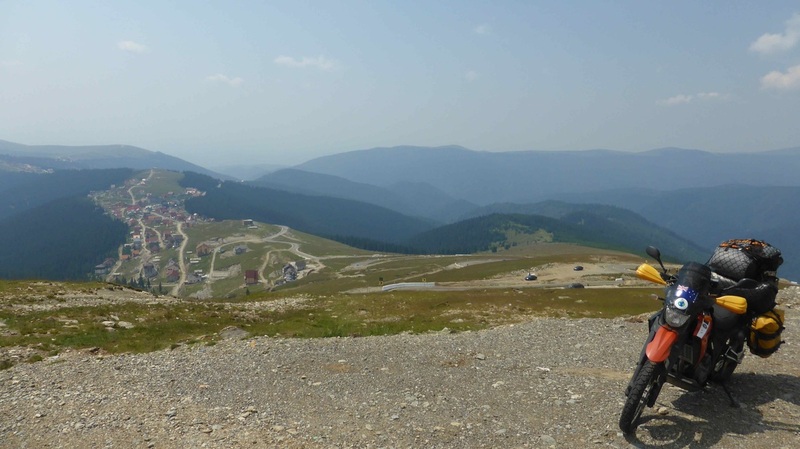 The sun was shining today, so Lyn and I rode back up the Transalpina to the top of the chairlift, much nicer than the cold wet ride the previous afternoon. We filled up our water bottles from the spring there, and headed back down to pick up Terry. The plan was to ride another pass Terry had been told about, and continue to Deva, but we only made it as far as Crivadia before the afternoon storms started, so we stopped at a hotel beside the road at about 5.00pm to have an early night. Just after 10.00pm a band started up at the bottom of the stairs, and continued until about 1.30am, with all the locals stamping their feet and clapping, so not much sleep. There goes the early night. After such a bad night, we couldn't get out of the place quick enough, so we got a good cheap breakfast down the road a bit. 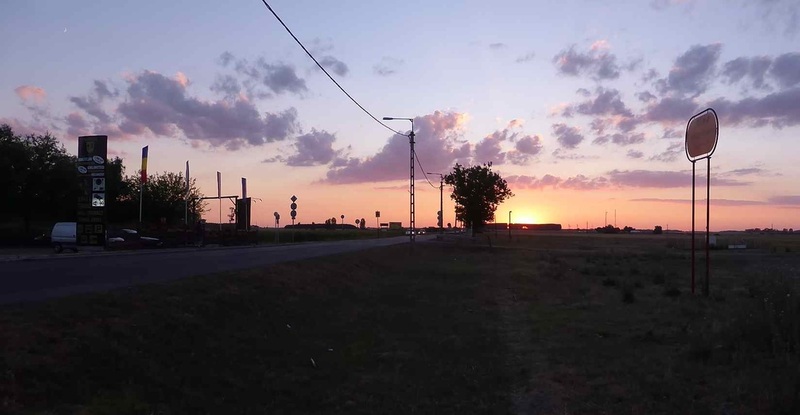 We wanted to make the Hungarian border if possible, but the roadworks were slowing us up. They would dig up half the road for kilometres at a time, then put portable traffic lights there so 1 lane could go, but a few times we met cars and trucks coming towards us claiming they had a green light as well, so their system needs work? After watching locals ignore the red lights and just go through them, maybe they were being careless with truth...... When in Rome etc.etc, so we started doing it as well, going slowly, and apart from having to pull over a few times, it seemed to work OK. We copped a heavy shower going over a range just after lunch, but that just cooled us off a bit, it had been hot riding. Terry nearly took out a couple of dogs going through one village, but we ended up missing them. Eastern european dogs seem to have a thing about chasing motorbikes. We made the border late in the day, and I crossed quickly using my UK passport, but Terry and Lyn took about half an hour with their Australian ones. We bought vinaigrettes over the border as we were told we needed them, but we were still not convinced! We found a hotel a few kms from the border, and got a good feed and a cheap room there for the night. Spectacular sunset, and it was very hot, and as the room didn't have air conditioning, we didn't sleep well.